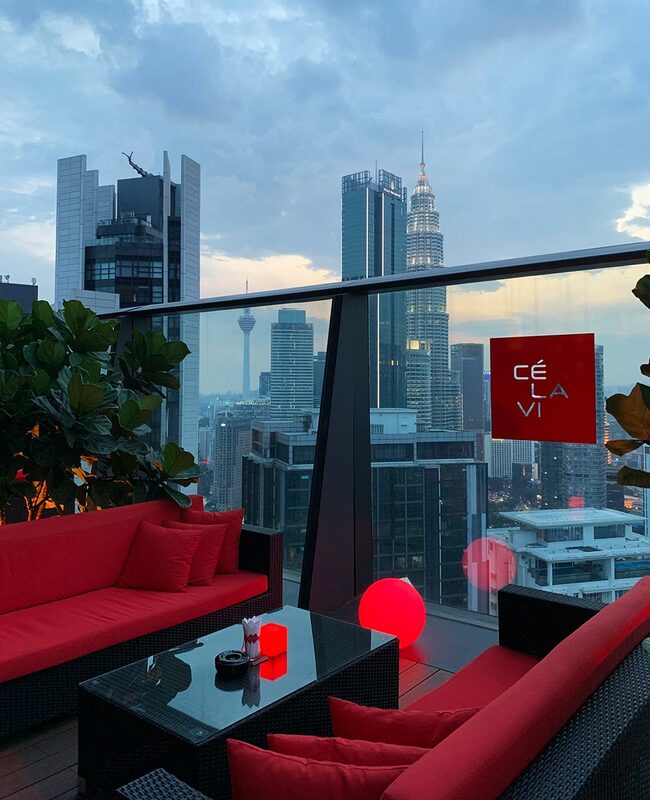 CÈ LA VI Kuala Lumpur offers high-end lounge vibes and a complete 360-view over the city skyline. Among a lot of other things. We spent a full, friendly and fun Friday night here and enjoyed every minute. 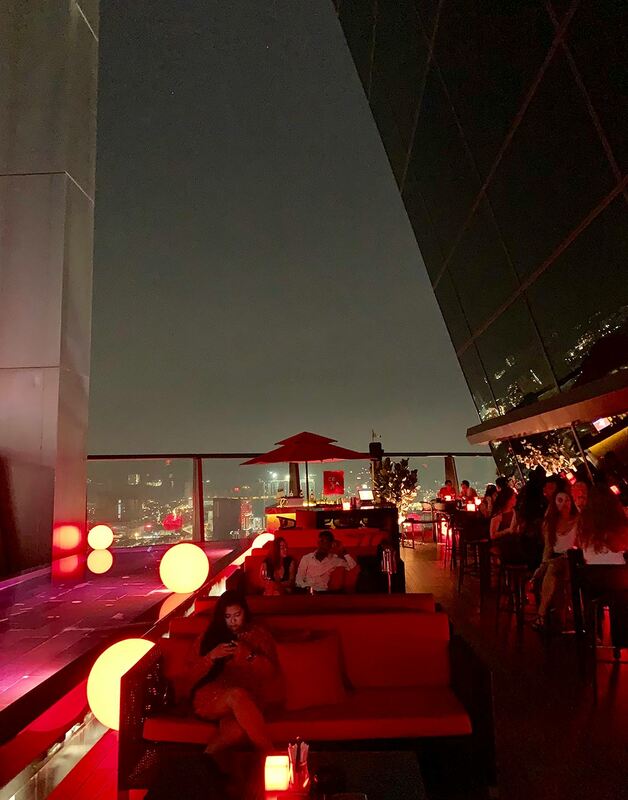 A famous night life destination, especially among us rooftop-lovers, CÈ LA VI can be found high above several cities, including Singapore, Hong Kong and Colombo. 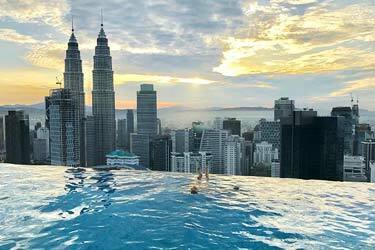 And since 2018, also above Kuala Lumpur. 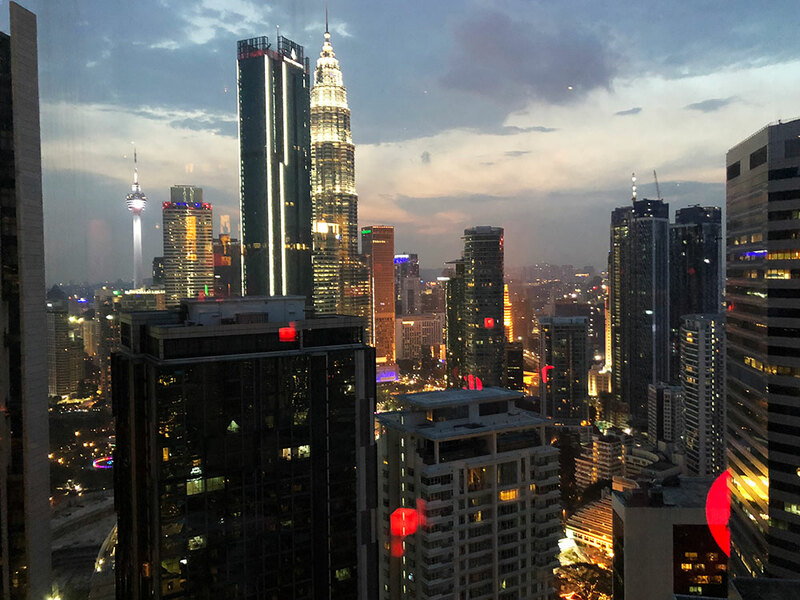 Located in the newly completed and luxurious Ilham Tower, close to the Petronas Twin Towers, we had made reservations at 7pm, just in time to catch the magnificent sunset. Read and watch our complete review below. 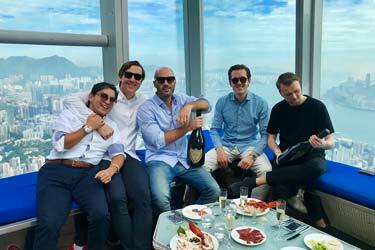 Coming up to the 37th floor, there are three options on where to go, since CÈ LA VI is divided into lounge, restaurant and club. We headed over to the lounge part, where we had our reservations and also spent most of the night. 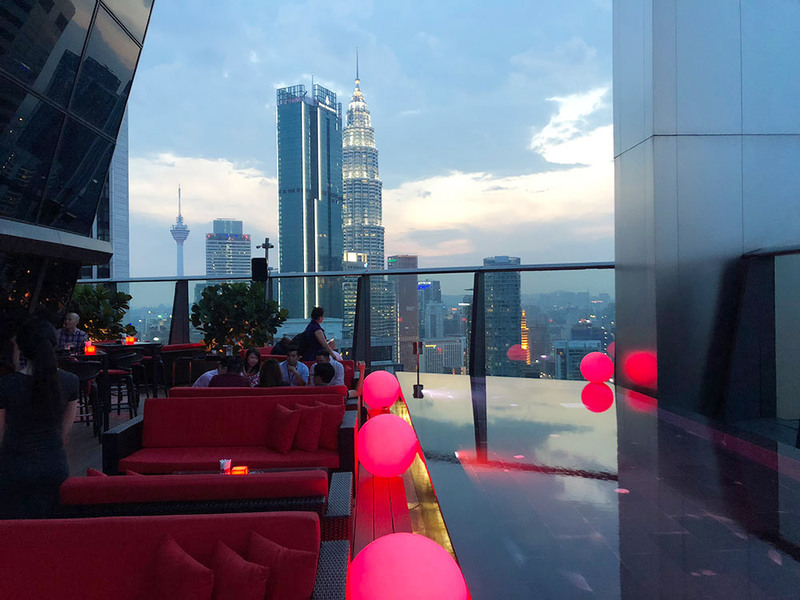 Walking through the indoor lounge- and bar part and out to the open air terrace, you are struck by two things: the very stylish and “classic” CÈ LA VI-red interior, and the panoramic views over the KL skyline. 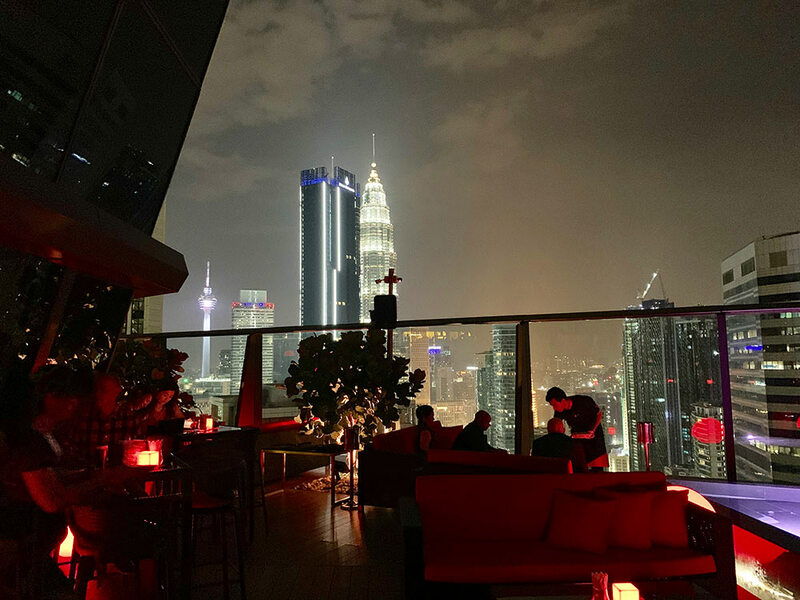 We got a fantastic table with comfy lounge sofas and front row views of the Petronas Twin Towers and the KL Tower. 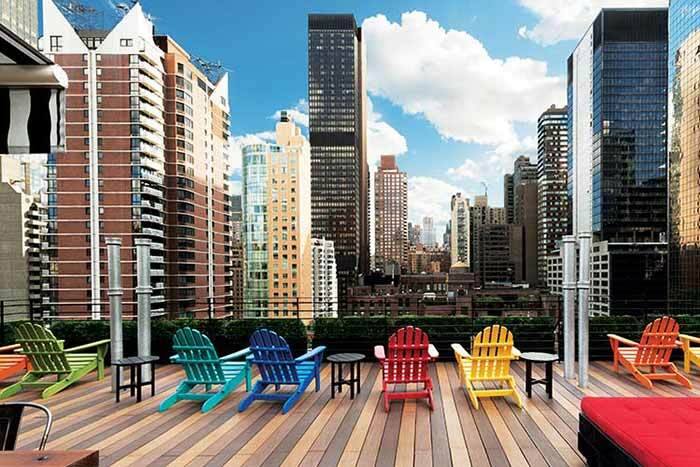 Walking around the lounge terrace, which crawls around three parts of the building, you also find views in all directions, a mix of lounge tables and higher bar stools and a really cool pool. 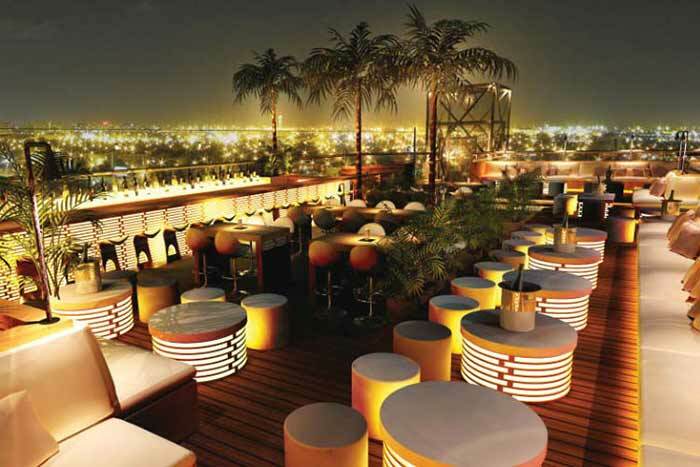 Not for swimming, but with floating red light 'balloons', it sure heightens the stylish setting of the terrace. 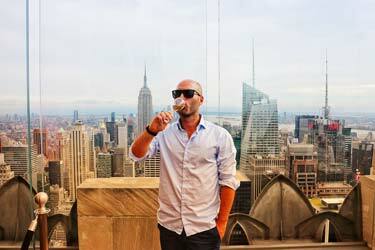 While CÈ LA VI is not set on the top floor of the Ilham Tower, the feeling is still very much open-air terrace. 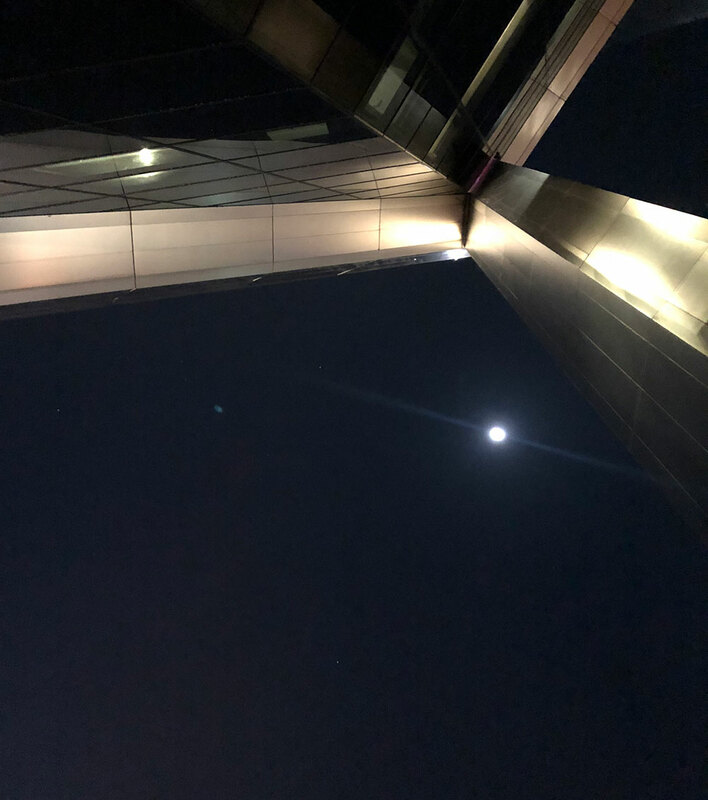 The ceiling is high, high above you and the inclined glass walls creates a really cool sight, both looking upwards and as a reflection towards the city. We arrived to a great and pretty soft lounge vibe and maybe half occupied terrace around sunset. 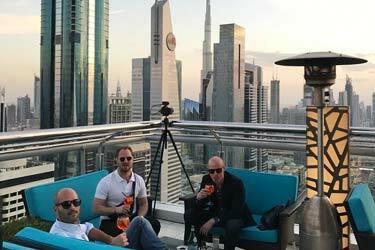 A nice mix of lounge tunes and people chatting, and a great spot for some stylish and relaxing sun downers. 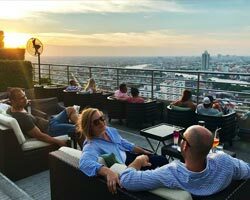 As the night wore on, the terrace filled up with more people and the atmosphere did get more and more vibrant, but always kept inside the ‘possible-to-talk, cool-and-relaxing’ region. 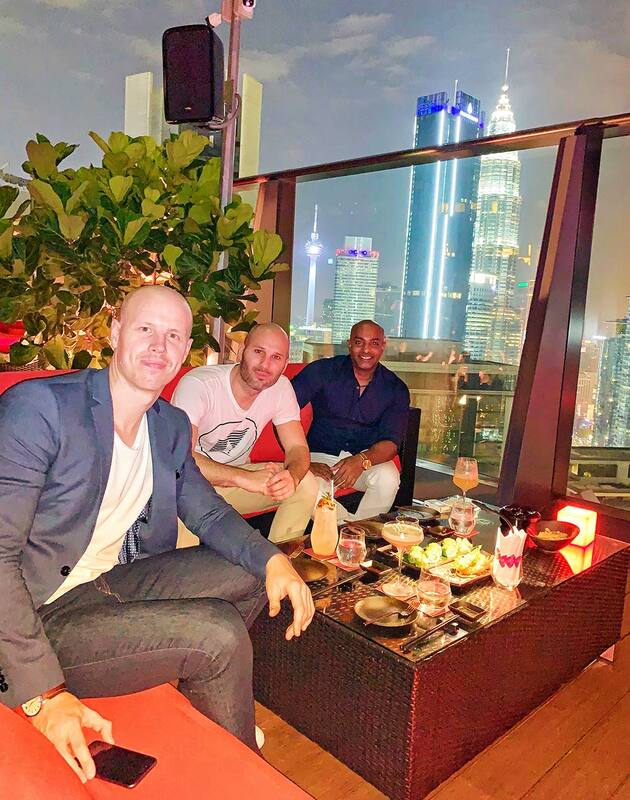 While just some good company makes it easy for the hours to pass by on any lovely rooftop terrace, CÈ LA VI sure also helped by feeling always happening and vibrant. The lounge tunes where mixed up with live DJs playing a mix of old hits, bringing some people to the small indoor dance floor. 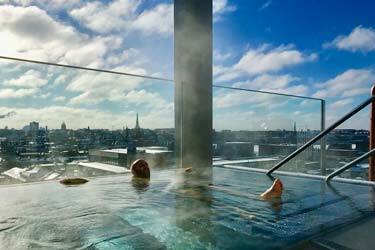 And the skyline views where mixed with a fire-dancer putting on a cool show in the rooftop pool. 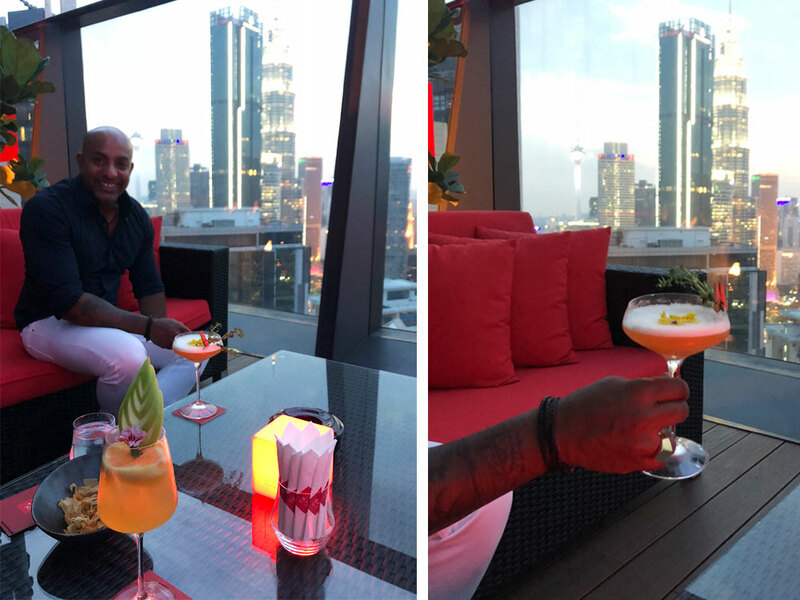 So most of our night was spent at the lounge terrace, but we also had a walk-through at the restaurant, and grabbed a late drink in the club. 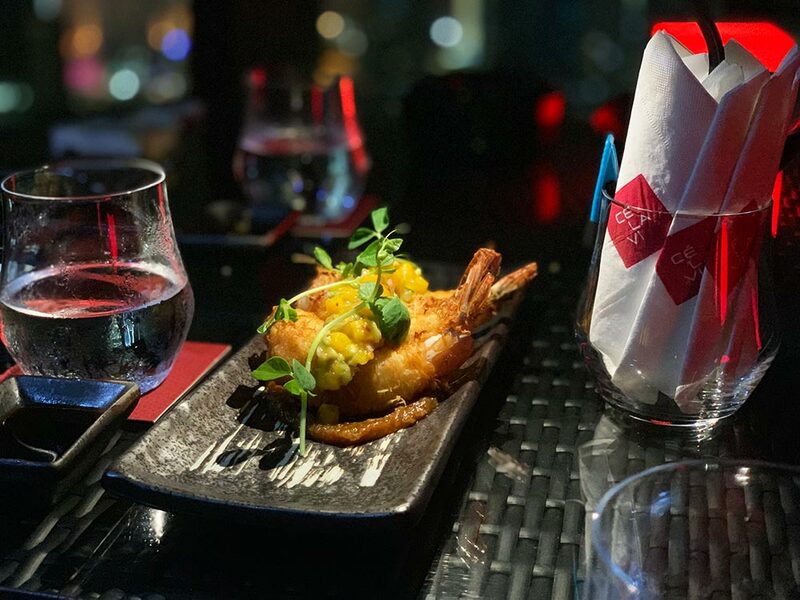 The restaurant is like a softer and more sophisticated mirror of the lounge, with a very stylish and calm indoor area leading out to a large and beautiful outdoor terrace. Seems like a fantastic spot for a romantic dinner. Behind some velvet drapes you find the club, which is all indoors, a lot darker than the lounge and restaurant and a real late night destination. We finished off our night in here, and while there was a great DJ playing awesome tunes, it was sort of an off-night crowd-wise, so we did not stay for that long. With more people around, it is for sure a banging place. During our 5-ish hour visit at the terrace we enjoyed a wide array of fantastic drinks and bites. 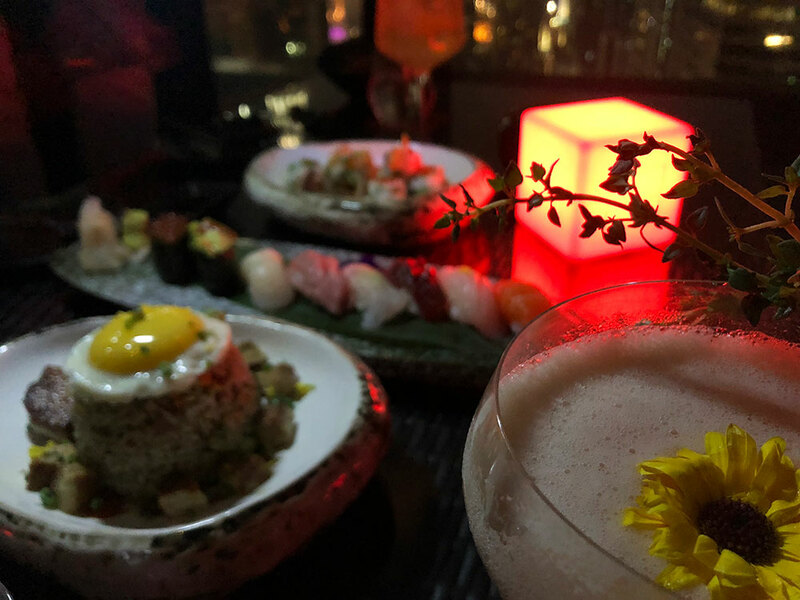 The CÈ LA VI menu is large and filled with Asian delicacies, classic and signature cocktails and a wide array of other drinks. Luckily we got some help with our choices from the very friendly and knowledgeable waiters. To keep the stomachs happy, we also filled the table with different bar bites, perfect to share. 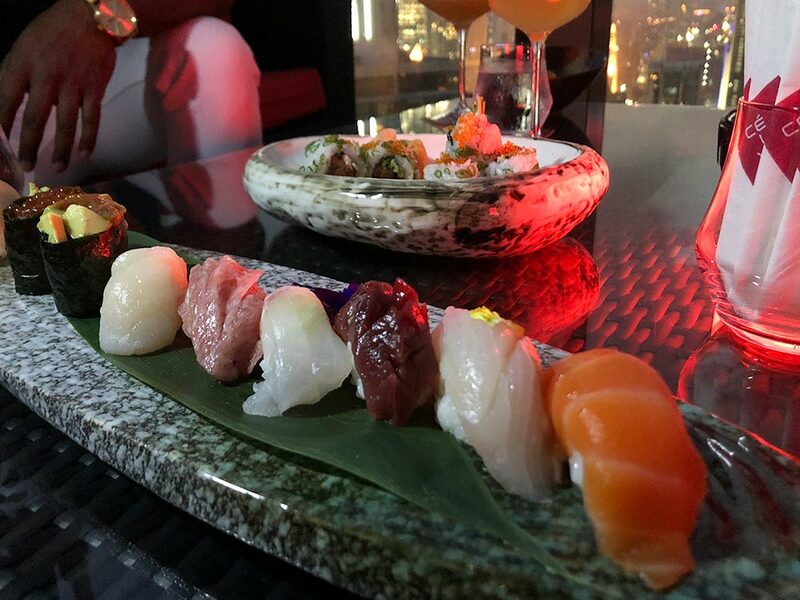 There was Spiced Kataifi Wrapped Prawn with mango salsa, Asian Taco (made with Wagyu minced beef) and Salmon Tartare Tacos, Foie Gras Fried Rice with a slow cooked egg, a Nigiri Sushi Platter with 8 different pieces, a set of Spicy Tuna Rool’s, mini-burgers and buns. Finished of with a resfreshing dessert called Trio of Matcha, with matcha ice cream and green tea mousse. 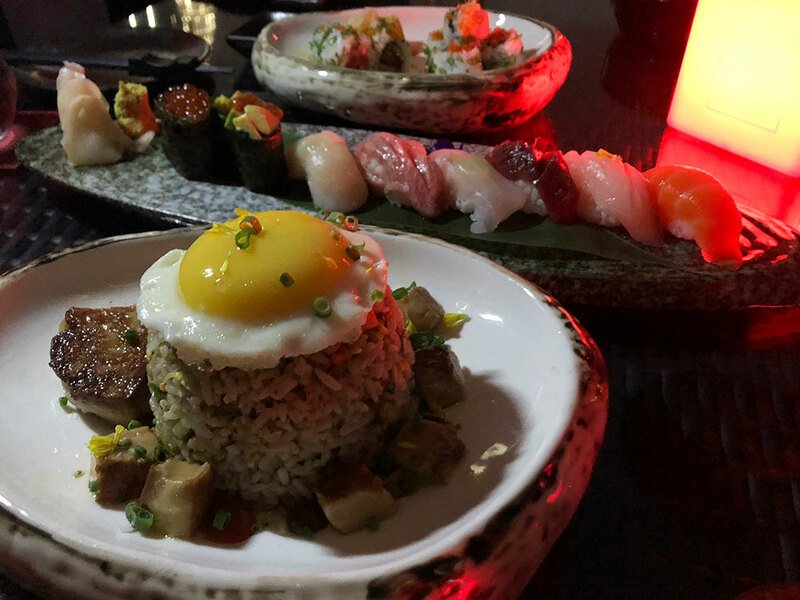 Almost impossible to pick a favourite, all dishes were actually really tasty, but since just ‘popping’ the slow cocked egg on top of the Foie Gras Fried Rice was a treat in itself, it deserves an extra mention. The stylish setting of CÈ LA VI also shines through in service from all the staff. 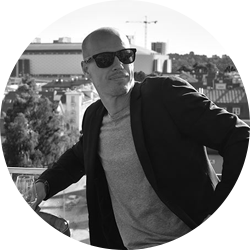 And it was not only professional (like someone holding the door for you while moving around different areas of the venue), but also felt relaxed and friendly, with the waiters happily giving personal suggestions, all with a smile. 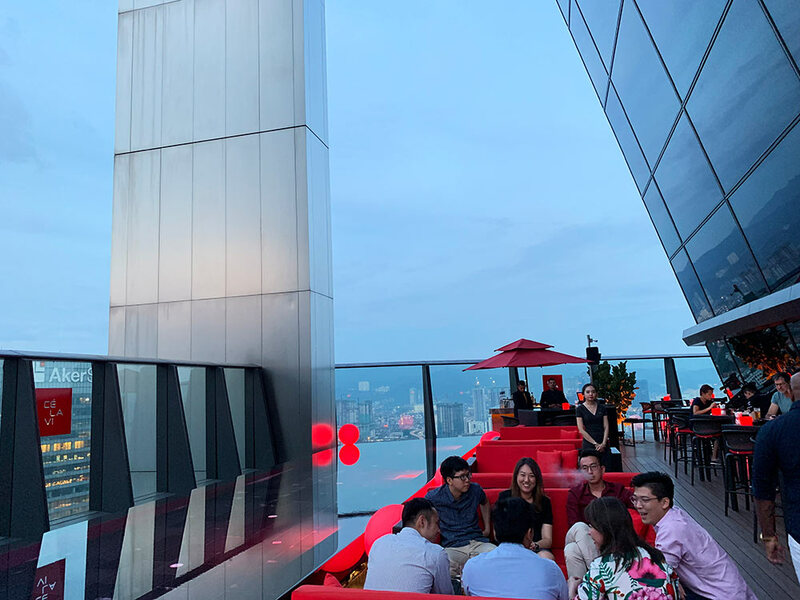 We also had to pleasure to have PR-manager Beverly as our company for a large part of the night, and she was truly a great host, telling us about CÈ LA VI in particular but also chatting about KL and life in general. So our big thanks to Beverly! 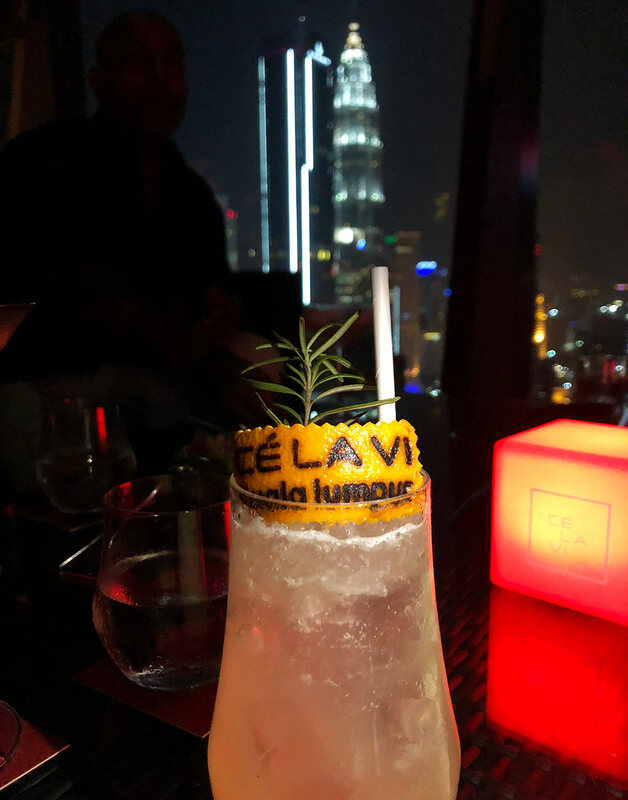 With the quite unique setting of having rooftop bar/lounge, restaurant and club, all in the same venue but still divided, CÈ LA VI is a fantastic place, possible to visit for so many different occasions. 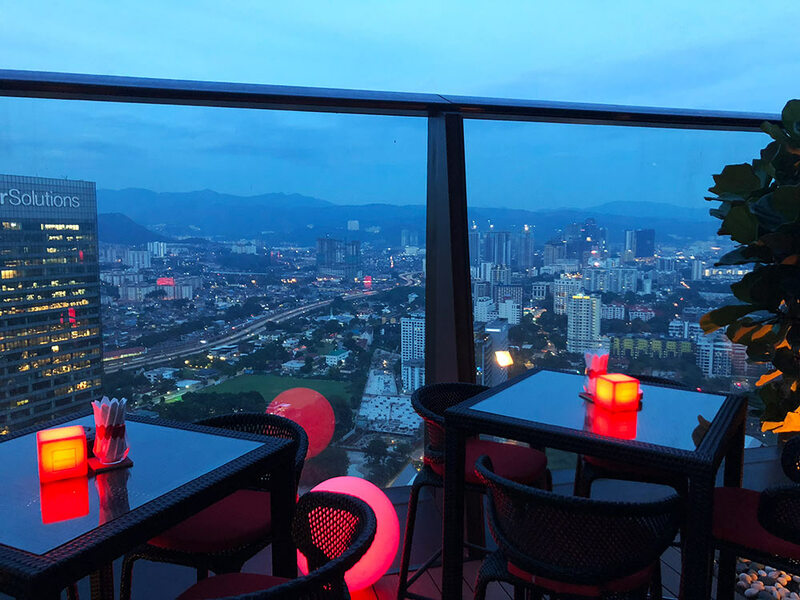 If you can just choose one, we would highly recommend visiting the rooftop lounge sometime around sunset hour and enjoy the fantastic KL-views, the stylish and relaxing lounge vibe and some of the very tasty cocktails and bites.